Address: 412780 Saratovskaya obl., Khvalynsk, Oktyabrskaya st., 2"b"
National Park Khvalynsky, in the Khvalynsky District of Saratovskaya Region, was founded in 1994; its area is 25,5 thousand ha. 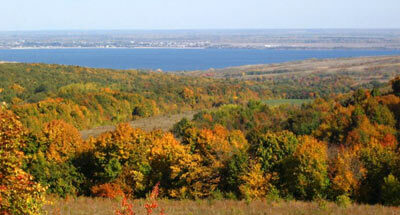 On the east the Park borders Saratovskoye water reservoir (from Alekseevka village to the Khvalynsk town). The Park includes highlands of the Khvalynsky range with absolute heights up to 370 m above sea level. 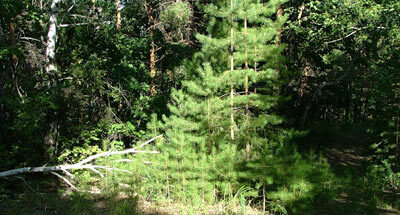 Natural complexes of small areas of pine forests within forest-steppe part of the valley remain. 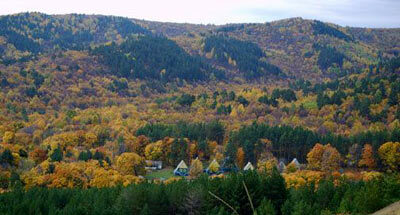 On the mountain tops and slopes grow pine forests with lime, oak, maple, aspen, undergrowth of Euonymus and walnut. There are sites of meadows steppes and grass feather steppes; among the grass slopes calciphils are abundant. Of rare plants there grow: yellow lady's slipper, Cephalanthera longifolia, Cephalanthera rubra, Anthemis trotzkiana, Calophaca wolgarica, Hyssopus cretaceus, Scrophularia cretacea, Matthiola fragrans, Silene cretacea, Stipa pulcherrima, Stipa dasyphylla and Stipa pennata. In the Park there are elk, wild boar, European roe, bobac, European hare, and marten. Of rare animals in the Red Data Book of the Russian Federation are musk rat, European bobac and erne.